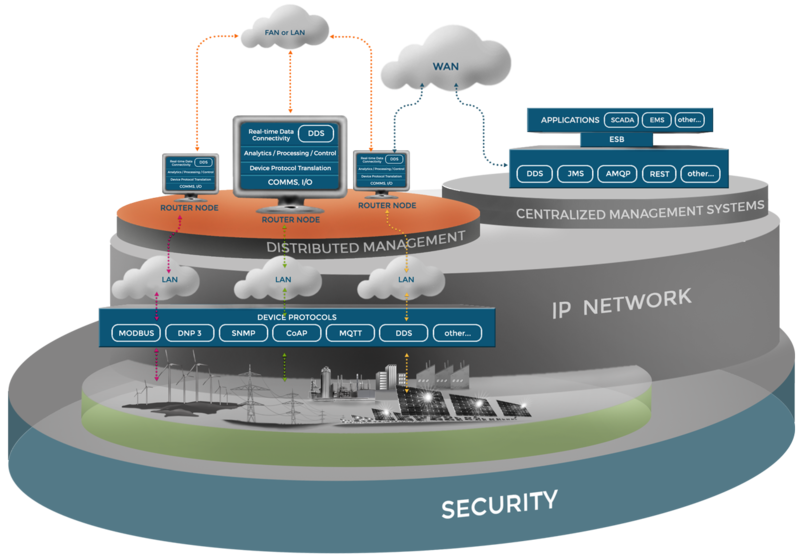 In Industrial Internet of Things (IIoT) application domains such as energy generation (including transmission and distribution), the co-ordination of operational systems (power plants, electrical power grids etc.) has traditionally been via back office centralized management infrastructure. Energy utility technologies and their data are often siloed, based on proprietary hardware from different vendors, and use many different communication protocols and telecommunication technologies to make the device data available to the centralized information systems. 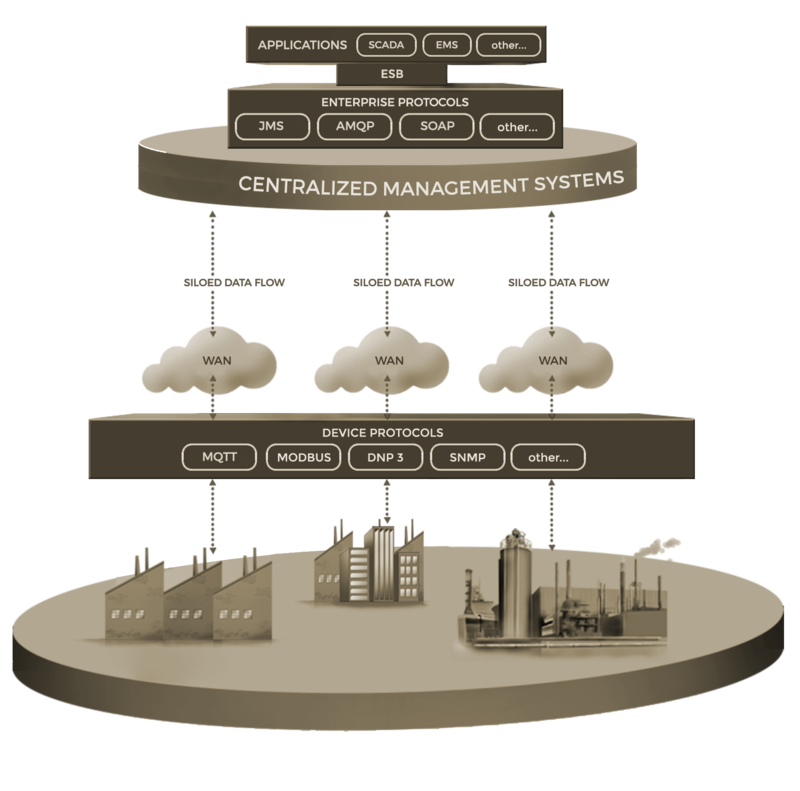 Open Architecture IoT solutions offer the potential for the energy industry to move from single function and proprietary centralized managed systems to new multi-function distributed control systems. They can enable co-ordination between grid-edge technologies and with the centralized systems, improving grid efficiency, reducing integration costs, enabling vendors to improve their products and ultimately, customers to pay less for the electricity that they consume. The next generation of energy grids will need to adopt new approaches for the integration of distributed grid-edge devices and equipment from many different manufacturers to realize operational benefits. Existing systems that were designed to support a small number of large generation facilities will be faced with the need to integrate an increasing number of Distributed Energy Resources (DERs) such as wind, solar and electricity storage into existing power generation and distribution networks. In the current business climate, the power industry has recognized the need for change. Already in Europe the profits of the large power utilities who have invested heavily in fossil fuel plants are starting to fall. In fact, over the last five years, the top 20 utilities in Europe have lost half of their value (source: http://www.greentechmedia.com/articles/read/this-is-what-the-utility-death-spiral-looks-like). Many of their large customers are leaving the grid as they adopt renewable energy resources and become self sufficient. This has the effect of pushing up energy costs for the customers who stay and encourages more companies to become self sufficient. These major shifts are forcing the utilities to re-assess their business models, driving them to greatly increase investment in wind power, solar and distribution projects to connect renewables into their existing grids in an attempt to arrest the decline in their profits. In the US the legal and commercial drivers for the adoption of renewables have not been as great up to this point. However, the US utilities have also recognized that things need to change. In 2013 US utility giant Duke Energy formed the “Coalition of the Willing” (COW), a consortium of grid technology vendors focused on the promotion and adoption of an Open Architecture approach to standardizing the way grid-edge technologies are integrated together. The consortium is made up of communications and grid control systems, electronics and software vendors. The initial COW member companies were limited to Duke Energy, Accenture Alstrom Grid, Ambient Corporation, Echelon, S&C Electric and Verizon. After successfully demonstrating in real-time how different grid devices could talk to each other without the need to contact a remote centralized management system and reducing the feedback control process from minutes to less than 10 seconds, the energy industry started to really take notice. The responsiveness that Duke and its partners demonstrated can enable a system to react dynamically to changes such as a sudden drop in the wind powering a farm of turbines. The distributed management system can automatically and in real-time (within seconds) switch in battery backup storage to ensure that a smooth voltage supply is maintained. This is something that is much harder to achieve if the process of communicating with a centralized system takes minutes. As a result, the consortium has quickly grown to over 25 companies, with new members including ABB, Cisco, Itron, PrismTech, Schweitzer and others. The ability to process data at the edge and share control decisions in real-time across device networks that were previously isolated from each other, is where the real value of the IIoT for the energy industry will be gained. DDS as part on an Open Architecture for edge-grids is a key enabler of this capability.